Locks, what is this all about? 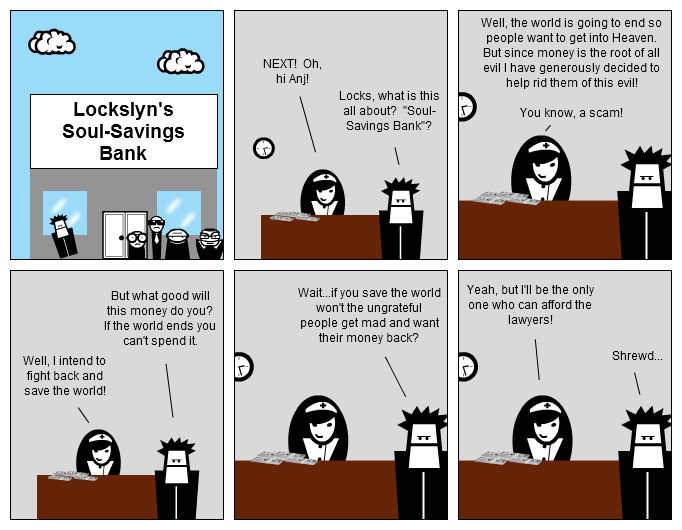 "Soul-Savings Bank"? Well, the world is going to end so people want to get into Heaven. But since money is the root of all evil I have generously decided to help rid them of this evil! But what good will this money do you? If the world ends you can't spend it. Well, I intend to fight back and save the world! Wait...if you save the world won't the ungrateful people get mad and want their money back? Yeah, but I'll be the only one who can afford the lawyers!